Padres-Dodgers in Los Angeles. Let’s go over the highlights. 1. Friday: Darth Vader throws out the first pitch. We saw how that worked out. 2. Friday: After giving up a leadoff single, Aaron Harang strikes out the next nine batters to set a Dodgers record. The man he beat, Johnny Podres, is one of the few professional athletes to come out of the Adirondack Mountains (hurray for the real upstate New York), and won Game 7 of the World Series in 1955. 3. Friday: The Dodgers squandered an 8-3 lead, and the Padres tied it up in the top of the ninth on a Chase Headley bomb to right center. Andrew Cashner came in to try to send the game into extra innings and promptly got the first two outs. Then he walked Mark Ellis. Then he walked Matt Kemp. Then he walked James Loney. With the bases loaded, the Padres brought in Joe Thatcher. Four pitches later, another rarity: a walk-off walk. 4. Saturday: Nancy Bea Hefley, the team’s organist, threw out the first pitch in honor of her 25th anniversary with the club. I can’t find any video, but I have to imagine that Hefley, who is an old woman, outperformed Darth Vader. 6. Saturday: After coming off the DL with neck stiffness, Ted Lilly allowed two hits over seven innings, throwing just 79 pitches in the process. The Dodgers rolled, 6-1. It was the first Dodgers triple play since 1998, and one of the strangest in recent memory. Dale Scott, the plate umpire, clearly put both hands in the air to indicate a foul ball (though he was right to let the play go on once the ball rolled fair), and he ejected Black moments later during the ensuing argument. 8. 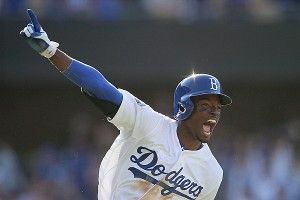 Sunday: In the bottom of the ninth inning, the Dodgers loaded the bases, and Dee Gordon sliced a walk-off single to left. The sweep moves the Dodgers to a league-best 9-1 on the season. Over the three games, Kemp went 7-10 with four home runs, seven RBIs, and five runs scored. He’s leading the league in just about everything after 10 games, and in the wake of a soap-operatic offseason, the Dodgers have quietly become the most exciting team in baseball. Let's Talk About the Dodgers' Triple Play!